Jenny Blake is an author, career and business strategist and international speaker who helps people move beyond burnout to build sustainable, dynamic careers they love. She is the author of Pivot: The Only Move That Matters is Your Next One (Portfolio/Penguin Random House, September 2016), which won an award for Axiom Best Business Book in the careers category. Jenny also hosts the popular Pivot Podcast, which CNBC listed among 6 podcasts to make you smarter about your career, and Entrepreneur selected as one of the top 20 female-hosted business podcasts. After two years at a technology start-up followed by five years at Google in Training and Career Development, Jenny moved to New York City in 2011 where she has been running her own consulting business in the years since. Jenny combines her love of technology with her superpower of simplifying complexity to help clients pivot their career or business. Her motto: if change is the only constant, let's get better at it. Today you can find her at PivotMethod.com. 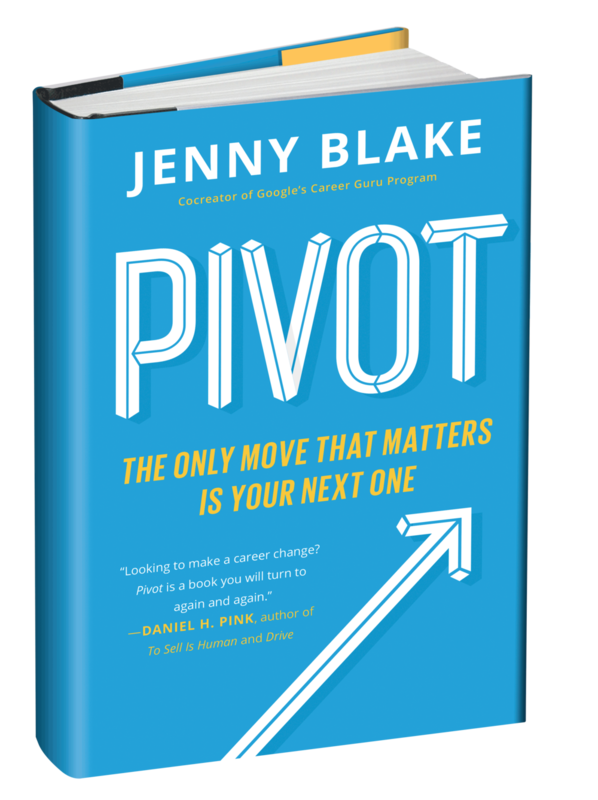 Subscribe to the Pivot Podcast and follow her on Twitter @jenny_blake. Jenny Blake is an author, career and business strategist and international speaker who helps people move beyond burnout to build sustainable, dynamic careers they love. She is the author of PIVOT: The Only Move That Matters is Your Next One (Portfolio/Penguin Random House, September 2016), and Life After College (Running Press, 2011). Born and raised in Silicon Valley, after two years at a technology start-up followed by five years at Google in Training and Career Development in Silicon Valley, Jenny moved to New York City in 2011 where she has been running her own consulting business in the years since. Jenny combines her love of technology with her superpower of simplifying complexity to help clients pivot their career or business. One of her personal mottos: if change is the only constant, let's get better at it. 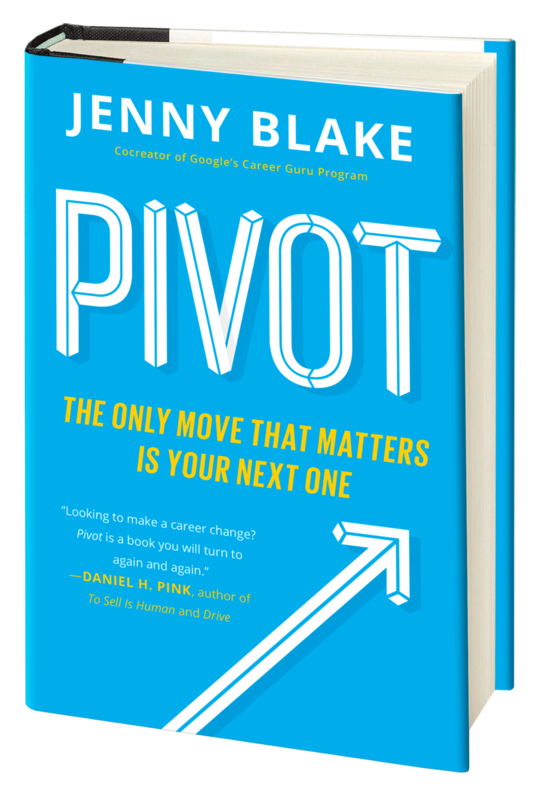 In 2017, Pivot won an award for Axiom Best Business Book in the careers category. JP Morgan selected Pivot for their client #NextList2017, Business Insider named it among the 20 best business books of 2016 and 7 books that will change the way you work in 2017. Jenny has been featured as a career change expert on CNBC, in The New York Times and The Sunday Times UK. Her Pivot Podcast is a top rated show that CNBC listed among 6 podcasts to make you smarter about your career, and selected by Entrepreneur as one of the top 20 female-hosted business podcasts. Today you can find her at PivotMethod.com, where she explores systems at the intersection of mind, body and business. Jenny is a yoga fanatic and avid book worm. Dogs, dancing, gadgets, writing, traveling, and long meals with friends all make her pretty happy too. Jenny is based in New York City, where she imagines she’s starring in a movie whenever she walks through its crowded streets. Subscribe to the Pivot Podcast, check out her private Momentum community for solopreneurs and side-hustlers, and follow her on Twitter @jenny_blake. Navigate through thumbnails below; right-click on images to save. Headshots are courtesy of Mark Hanauer.